I used to wonder why it took so much energy just to exist in normal society. I just assumed that it was something I had to accept, another limitation of Post Traumatic Stress. I now understand the neuroscience behind what happens to our bodies when we get stuck in fight or flight. Everything makes more sense to me now because all of my issues were related to my body being frozen in time. I just didn’t know what was happening or what to do about it. Everything I tried felt like a temporary band-aid. I have come a long way in the last year especially. After retiring, I went from the military’s warfighting mission to a new mission to end violence in the military. I stayed in that mission mode for three more years after retiring because that is what felt comfortable. I learned early on in my career that mission comes before self. As a matter of fact it is one of the Air Force’s core values: excellence, integrity, and service before self. I didn’t realize how harmful that one core value was to me because it became my mantra. I pushed through the pain and sacrificed myself for the mission regardless of the impact that it had on me. It was after I got my service dog Onyx that I realized just how hypervigilant and distrustful I had become. Before the dog, I had to have an anti-anxiety pill just to cope with anything outside my realm of comfort. My home had become my safe haven but it also became a prison because I didn’t know how to cope outside the home when I did give it the old college try. I was blessed with a beautiful woman who understood wholeheartedly what it was like to feel trapped within the four walls of your own home; it had happened to her son too. My trapped feelings went even deeper. Before my father died, he gave me his home and told me that these four walls would always be here to protect me, even if he wasn’t. It gave me so much comfort while I was coping with the loss of the one man who truly admired and loved me. Shari Duval of K9s for Warriors gently guided me to Florida to go through the three week program of training with a service dog. It had been years since I was able to cry or feel emotion but I felt it the first time I ever met Onyx. The first time I ever met her, I felt like we had been reunited, not meeting for the first time. It was something I will never fully be able to understand or describe. Onyx helped me take the first steps I needed to heal and become the person that I truly want to be. K9s for Warriors showed me how kind people are and I was super thankful for all the support and love I received while attending the program. It helped me realize that not everyone had a hidden agenda and people do truly care about our veterans. I got more thanks from K9s for Warriors then I ever did the entire fourteen years I served in the US Military. After the K9s for Warriors program ended, I returned home and stopped taking the addictive anti-anxiety pills (Klonipin) I had been taking for years. After detoxing off those horrible pills for over a month, I realized that they actually were part of the problem. Anti-anxieties are good for the acute stress after traumatic events but they should not be taken on a long term basis. After having a discussion with my psychiatrist at Veterans Affairs, I learned that they are finally realizing that anti-anxiety medication actually makes the fear response worse. My fear response was so bad while taking those medications that I was literally trapped in my own body. I would never have realized this had I not had the strength to get a service dog. Once I got Onyx, I finally felt safe enough to not only venture outside my home by myself (without my husband) but I was able to take trips by myself to visit my friends. This was key to my healing as well because I realized while spending time with these people that others cared and loved me too. They did everything they could to break through my walls and were successful. They reached out to me and secured the friendships that we have today. After spending quality time with those I had met in our journey for justice for all, I realized that I was not alone and that I did have some great people in my life. I had accepted that the people already in my life were all I needed and closed myself off from new opportunities for real friendships. This too is part of the healing journey. Despite working through the anxiety so that I could interact with society, I still felt either UP or DOWN. It took all my energy to do anything physical because my body was stuck in fight or flight and I didn’t realize it. Thanks to Onyx, I had the strength to go to another program dedicated to helping veterans with PTSD from Military Sexual Trauma. I learned about the neuroscience behind the fight or flight response and the light went on. I realized that despite my mind feeling better that my body was not. Fight or flight response causes our bodies to tighten in the pelvic and upper back and neck region (fetal position). This explained the aches and pains that came with PTSD. I don’t have any serious back injuries or other physical ailments aside from what being stuck in fight or flight was doing to me. My body was hyperextended and now I understood why I had pain running down my legs and why I would get so tight in my upper back and neck region, which was ultimately causing headaches. While attending the Artemis Rising Recovery Program, I was educated about how PTSD impacts our body. In order to work through PTSD, we must understand the mind, body, and spirit connection. I had been focused on the mind and spirit but had not dealt with the impacts on my body until my time at Boulder Crest Retreat for Military & Veteran Wellness. Everything we did helped us work through the fight or flight stance we had been frozen in. After learning about the impacts it had on my body, the light went on and I realized exactly what had happened to me. It was not just one thing that helped me make that realization, I learned from a group of people that all these things were connected. We learned that meditation, journaling, EMDR, Somatic Therapy, equine therapy, yoga, acupuncture, and recreational activities like art & hiking were also very good for the mind and body. It was the combination of all these techniques for a two week period, a specific goal of working on our own bodies, that helped me pull out of the fight or flight position. It didn’t happen until about 10 days into it. And I remember exactly where it happened. 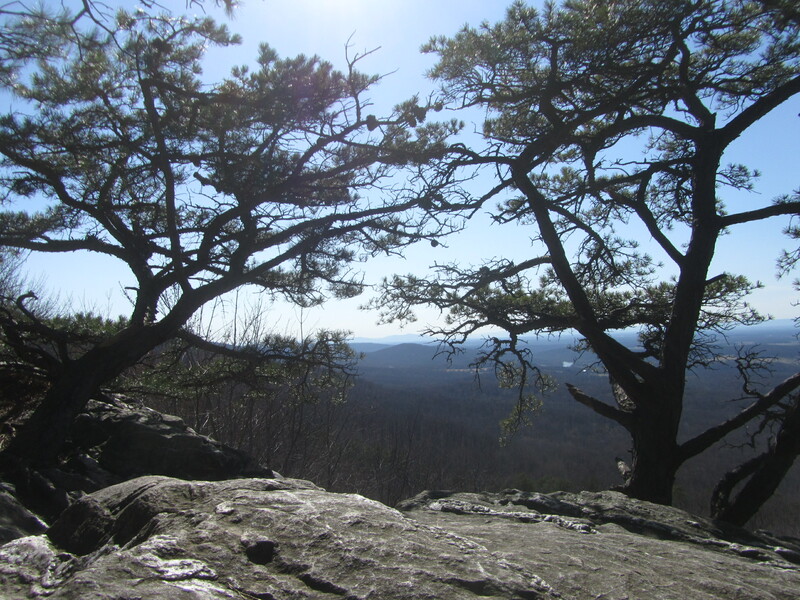 I was atop a hiking trail at Bear’s Den which is part of the Appalachian Trail system. I felt it finally release in my pelvic region once we reached our destination and I sat down to rest. It was incredible and scary. Like I said, I didn’t have any back injuries to contend with so it felt weird when the fight or flight finally gave. And after it happened, I was terribly sore and have been getting less sore over time. I was told that I am using new muscles now that the fight or flight released and that the soreness was to be expected. Just like with any workout, if you haven’t used a specific muscle in awhile, when you finally do, it is going to be sore. As time went on, I could feel my body standing up straighter, my stance change, and my natural desire to stay in the fetal position start to alleviate and dissipate. I have never felt so free in my life. Now I understand why walking, hiking, and all the other activities I used to enjoy became so cumbersome. My body was never fully relaxed to truly enjoy the healthy benefits of those activities. I have always loved these kind of activities but even grew to resent them over time because I was so tense. I was using those activities to help my body but it was only working temporarily and was hard on my hyperextended body. Now when I do these activities, it doesn’t feel like the work that it did before. Now, it feels like my body is into it because the fight or flight response has relaxed. Now I realize that these activities will help prevent the body from going back into fight or flight response. But the biggest lesson I learned was that until the fight or flight response is dealt with, everything else feels ineffective despite your efforts to give it all you have. If only I had learned these lessons years ago. It’s about time that the VA start treating our veterans with these traditional healing modalities. It would expedite the healing process and help us enjoy what life has to offer in whole. My new mission is to prevent my body from ever going back to that place. It hurt and it doesn’t have to if we pay attention to our bodies. Once you learn what is happening to your body, then it doesn’t feel like you are a victim of your own body but instead are empowered to understand what is needs from you. I am currently medication free. I have slept without the use of sleep medication since I returned home from Artemis Rising. My body needed food, sleep, and most of all activity. Now, I look forward to these activities because of what it will continue to do for me. Onyx will help me with the things that do instill fight or flight. But, I will prevent it from ever going back to where it went after becoming the victim of a crime perpetrated by someone I was supposed to trust with my life. Help us heal our military and veterans so they can enjoy the same. They deserve it after all they have sacrificed. Jennifer, I am absolutely thrilled to read that you also now are alumni from this wondrous program! I am equally grateful to have heard my own light-switch click on, much as you described in day ten. My symptoms are ‘moderate’ since the program and that is a dramatic improvement over ‘critical’ where most of the intake data fell for me. I’m so proud of your personal accomplishments, your tremendous value to our communities, and your unwavering voice of dedication to all M.S.T. Survivors. Reblogging this on WarRetreat. I’m glad you found Onyx, and that she was the key to seeking new treatment! Three cheers for Onyx! Hypervigilance, anxiety, flight or fight. Trauma manifesting itself in both body & mind. The source of her relief? A service dog. is there any clear steps to release trauma from body? EMDR at the Boulder Crest Retreat for military & veterans really helped me. It was a life changing experience. I have benn in the military but not the extent that you have. I’ve been on the same medications too. I was sexually abused in the military but kept it quiet. My experience with remaining in fight or flight mode has been from an abusive marriage. For 6 yrs I’ve tried to get divorced and he keeps abusing me through the court system, parental alienation and any way possible that he can. I’ve had arthritis tests, back ex rays for slipped disc, fibromyalgia tests, you name it, I’ve tried to find any answer. I can’t muster up the energy to get out of bed to even want to excercise but I get out of bed. I’m tired and I don’t want to be on medicine. But where I live they don’t believe abuse causes PTSD. I’m just glad to not feel alone and that its “not in your head”. It exists and our bodies react to stress I ways that I believe are beyond most people’s comprehension. Thank you for your article. I just wanted to add that I was born stuck in fight or flight mode. It was genetically inherited. It was exacerbated following 2 armed robberies at my workplace. I tried many healing modalities which all offered great support but the key to it all was when I saw a chiropractor. He identified a subluxation (misalignment) in the t11 vertebra. The nerves emanating from this vertebra feed a few organs but are tied to the adrenal glands and the ‘fight or flight’ mode. Correcting this misalignment allowed the adrenal glands to return to a balanced state and correct the fight or flight. It may help some if you out there. Get the spine checked! Yes! I just did this and not did it fire up the nervous system but after treatment calmed back down and I do feel better. It’s amazing how everything is connected.